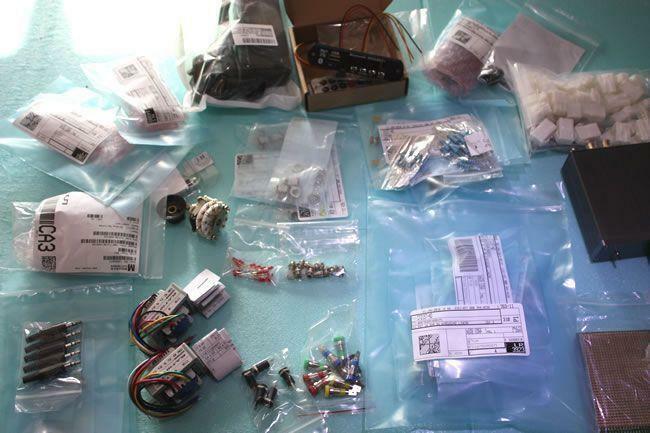 After waiting what seems like forever I have just about everything that I need to start my Stereostim E-stim Control Box build. There are a few things I still need such as a box or enclosure for it, but I can't finalise the size that I need until after I have to build a test version of it on the bench to check it works and to work out my space envelope for the box. Here is a pic of most of the components, there are a few others out of shot, but you can see that this has dozens of components to assemble. I have a few reservations about my front panel design, and the biggest is whether or not all of the parts will fit that tightly together on the inside of the front panel. I, therefore, dug out an old Tupperware box, printed out a full-sized copy of the front panel and I glued it to the side of the Tupperware box. This copy allowed me to drill out all the holes for the components and to be able to build the desktop version of the system actually inside the box. This will allow me to sort out wiring runs and I will be able to securely mount all of the small components like LEDs and switched that would just get trashed if I built it flat on my desk. This seems like a logical approach, and while it won't look pretty, it will satisfy my curiosity as to whether everything will fit together on my chosen size of front panel 9"/22.8cm by 3.9"/9.9cm. I decided to tackle the two most intricate and worrying parts of the design, and those are the Electrode Routing Switch (4 poles 12 way) and the Tri-Phase electrode joining switch (4 poles 5 way). 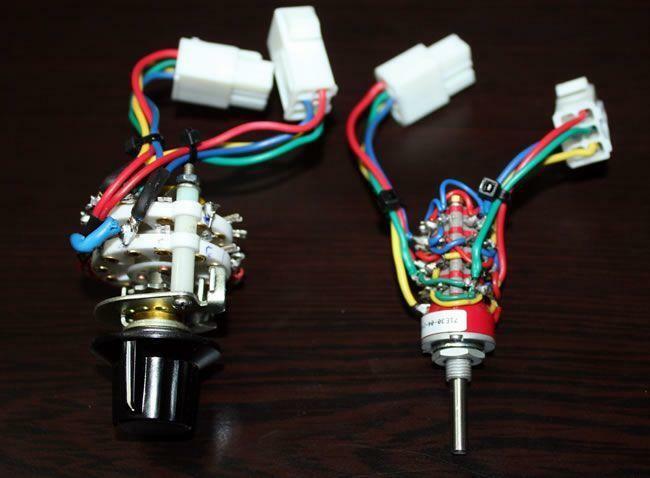 Both of these switches have been built with male and female sockets on short lengths of wire coming from them. This way as everything is modular, if I get a fault, I can just disconnect the problem module and bypass it. I will then only lose that modules functionality, but I will still be able to use the box. My first problem was my choice of wire. I had gone for 1mm2 wire which is way too thick. I then remembered that my partner had some spare 12-way trailer cable in the garage and so I pinched a bit and stripped that down to use the thinner wire. This has is proved to be much better. Read Part 2 of my build diary next.